Proper posture keeps muscles, ligaments, bones and internal organs in their natural position. It reduces wear and tear of joints and relieves stress, improving health and enhancing your appearance. Let's learn some healthy postures. Always place the laptop on a stable base and not on your lap. Sit up straight with your lower back supported. 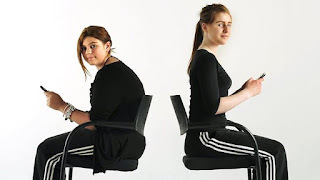 Adjust the height of your chair so that you can use the keyboard with your wrists and forearms straight and level with the floor. Have your knees level with your hips. Do not cross your legs. Not because of any superstition. 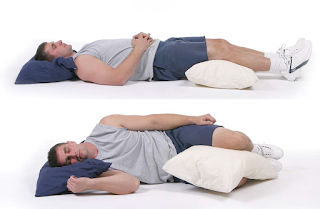 Because that posture can cut off blood circulation and cause hip problems. Check that you can easily slide your fingers under your thigh at the edge of the office chair. Always remember to stand, stretch and walk for at least a minute or two every hour. Never Sleep on your stomach. It can cause back or neck strain. Sleep on your side or on your back. You may use a pillow in between your knees to flatten your back. Avoid heavy backpacks while riding bikes and avoid sudden breaks. Slow down over a pothole and tuck in your stomach. This stabilizes the spine and reduces back strain. When driving a car, prop up a pillow to sit high enough to see out of the front and side windows and in the mirrors. Move the seat forward until you can easily depress the clutch and accelerator pedals. If you are at your desk for a long time, remember to take a break and do a few stretches to help help ease your back, neck and shoulders. Do not use mobile phones continuously for a long time. Repeated use of mobile for texting or whatsaaping or what ever you call, will lead to 'text neck'- a repetitive stress injury with a chronic pain shooting down the neck, through the arms to the fingertips. Do not carry bags on one shoulder or hand for a long time. Do not spend a lot of time slouching and hunching over. This 'turtle posture' affects neck, shoulder and back muscles, causing muscle shortening and tightness. Always try to keep a good posture. Stay hydrated. Drinking plenty of water keeps the spinal discs lubricated and healthy.